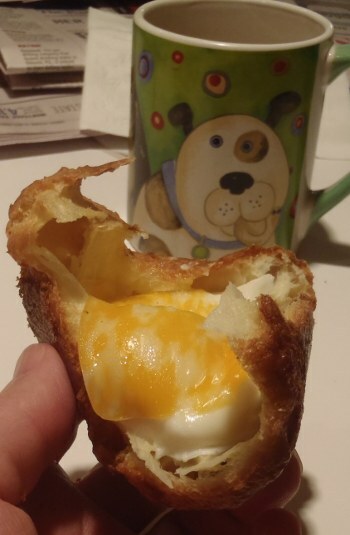 Freshly baked popover with a perfecly poached egg, melted cheddar-jack cheese and freshly ground coffee. Want an awesome breakfast, but are a little short on time? Don’t want to make a whole pan because you’ll eat them all? Fresh, Home-Made Toaster Oven Popovers For Two is for you! These popovers are so incredibly light, crispy and awesome, with a hollow interior, just right for a perfectly poached egg, that you’ll want to blow off the rest of the day just to linger over breakfast, fresh coffee and a newspaper. They go beautifully with a bacon, mushroom, onion and cheese omelet. 1/3 C All-purpose flour, sifted (measure after sifting). 1 Teaspoon All-purpose flour (optional – if you like more “insides”). Liberally butter the inside of two metal 1 cup measuring cups or ceramic ramekins, especially the bottom. Make sure the egg and milk are at room temperature. (see note). Place the egg and milk and melted butter in a small bowl and whisk until combined. Add the flour and salt and whisk until smooth. Place half the batter into each cup and place in oven. Bake until crusty and brown, about 15 minutes or until browned. Reduce oven temperature to 325°F and bake another 10 minutes to firm up the insides. Don’t let them burn! All the milk and eggs must be at room temperature. The physics involved with making the popovers puff up require that steam be created inside, before the outside hardens. If your ingredients are cold, this won’t happen and the popover won’t puff up. The timing is really dependent on your toaster oven. You would need to make a test batch first, to figure out exactly how long it’s going to take. Do you still use the same cooking time if you are using a mini pop over pan for these? I’m having my gals for brunch n the oven will be full of roast beast as I’m doing a reverse sear version. I hv an ood toaster oven n would love to use it so the minis are ready at the same time as the roast..Thnx for any input. Cheers! I do the “popovers for two” in a couple of ceramic ramekins. They’re only a dollar or two. When I do the whole recipe, I use actual popover pans that do 6 each. Where did you find your little popover pan?